Letting go is a curious thing. For many people, it’s the art of living. They meditate, take courses, look at themselves and strive to live their lives as unattached as possible. Letting go is an important skill. But what is letting go? Why is it so difficult? Or does it only seem that way? I think that letting go is the ability to not get bothered about the things you don’t need to get bothered about. It’s the art of letting go of your past. The future is also not important. The only thing that matters is here and now. It’s when you look at your problems and you ask yourself: can I do something about it here and now? You then have two options: either you can do something about it, then: “Do it!” I’d say. Or you can’t do anything about it: Let go! Don’t worry about it again until you can do something about it. We humans have the tendency to hold onto all kinds of things: matter, money and other people. We prefer to put everything in a big box labeled: “Mine!” Especially when it’s about the love of your life. Or your child. “Mine!” And you prefer to never let go. But all of life is letting go. Your child grows up, becomes independent. Your pet doesn’t become as old as you’d hoped. Your job is uncertain, and – whoosh – it’s gone! Or your partner. Or the house you live in. We think that everything is certain and will stay that way forever, until we are suddenly confronted with that one thing we have so much trouble dealing with: Change! We are forced to let go. Oh no, change! It never stays the same! We find that especially unpleasant. We have to adjust, reorganize and find new ways of living. It usually causes a great deal of stress and fear. Yet, change gives life its greatest meaning. That’s exactly why we are here on earth, because things change. Because you want to grow! Deep in your heart, you want to change and grow. And that means letting go. And yes, sometimes that is painful. But growth is also super! Change can bring about so much beauty! And the better you can let go, the better you can ride the waves of the sea instead of being washed away. Are you a retainer, an introvert? Do you find it difficult to let go? Do you still think back with anger at what happened to you 12 years ago? Do you remember the unpleasant teacher? Do you remember how your colleague laughed when you were fired? Or everything that went wrong at your wedding? How difficult is it for you to let go? If you recognize yourself in this, realize that you are hurting your own health. By holding onto old pain, old grief, bad memories, old anger, you are making your cells unhealthy. All the digestive processes become more difficult and everything in your body flows more slowly. Realize that you have a key to your health right here in your own hands. If you would like to let go, to free yourself, do the exercise below! The 9 steps already incorporate letting go! Especially step 3: “Detach father. Detach mother.” and step 4: “Clear meridians” with the large intestine meridian. The storage of emotions takes place in the intestines. If the large intestine meridian is blocked, you can’t let go. That’s the reason why so many people who experience stress in their jobs (teachers, healthcare providers) have problems with their intestines. If you want to be active in letting go of old burdens, you can do the MIR-Method on your abdomen. You lay your hand on your abdomen, just under the navel. You stroke one hand with the other and say the 9 steps. Same as always. The only difference is that you don’t have your hands in the air but on your abdomen. Do this 2x a day, same as always. Letting go and change. We don’t like them. And yet, they give our lives meaning. Do you find letting go and change difficult? Let the MIR-Method support you! Just as long as is necessary to be able to let go. Do you lay awake at night, fretting? Then do the MIR-Method on your abdomen as well. Wishing you much peace! 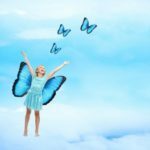 May I know how the MIR-Method has helped you to let go? What has it brought you? Please write about it below! Thank you!! I do find I am missing doing the routine some nights during the month schedule. I’ve added on a few extra days but not sure if this counts. I do feel the routine is good as it clears out old memories and helps one live in the present. I will try doing it on the abdomen as I do ruminate and ‘hold on’ to fears and worries which cause a lot of distress. I recently felt pain in my left hip area down towards knee and not sure if it’s ‘wear and tear’. I have Osteoarthritis in neck and lumbar spine which might be aggravating legs now. Thank you very much for devising this routine as I do feel it all helps balance our lives. Sure, these extra days count! Don’t worry too strictly about the 1 month period. See it as a tool you can use for the rest of your life. If you miss a day, that doesn’t mean the method doesn’t work. Please have a look at the frequently asked questions about this. And in one of my researches in the Netherlands rheumatism was ‘the blocking of healing force’. This means that people with rheumatism are actually healers who stop their healing energy from flowing. Does this make sense to you? The pain in your legs may mean your healing energies are starting to flow again. Just keep doing the MIR-Method longer, for as long as you still have pain issues. Is the loss of a child considered something we have to let go? The loss of a child is an enormously unbearable kind of grief. I don’t know if it will ever leave your system. However, if the grief after a whole year, is still hindering you in every way, you may want try to lessen the grief. And trying to let go of it for several hours a day, so you can pick up your life. thank for all this information!!! Lots of love from Barcelona!!! And thank you for embracing it! Please spread it around Barcelong! The MIR-Method helps me to cope with my mothers Alzheimer Desease. Detach Father, Detach Mother was, surprisingly, not about letting go but to free myself from the child who needs father and mother figures to stay alive. I am much more relaxed with people in my every day life! Great to hear from you that it feels so good. I am very glad you are freeing yourself in this way! great article, I will try this for sure :). Thank you so much for your idea! We have been working on an app for the MIR-Method, but up till now we have had more important projects to spend money on. There needs to be much more funding to be able to produce an app. I hope maybe next year we will manage. Meanwhile just print the 9 steps and hang them everywhere in your house: beside your bed, in the bathroom, on your mirror, on the fridge. That way it is a little bit easier to remember to do it. Thank you for your beautiful supporting work, clearness and generosity!